August 15, 2016 Daniel G.
Just a few hours away from Silicon Valley, these spectacular hiking destinations will transport your body, mind, and spirit to the most spectacular sightings, hiking, biking, and running adventures you’ll experience this summer! June 20, 2016 Daniel G.
Summer is here! Officially starting today June 20, so start planning your escape into fun. The best ways to do that in the Bay Area are in the water and out in nature, and there’s plenty of both. Here are some ideas to get you started. Mountain View residents are rarely at a loss for things to do and get involved in. This city of approximately 74,000 situated in the heart of Silicon Valley is perfectly suited for a busy life with plenty of exciting activities within a short drive in any direction. One of the shortest drives is to the city’s own Shoreline Park.Officially dedicated in 1983, the site was purchased by the City of Mountain View in 1968 with the goal of building a recreational facility, which would have required building up the land 20 feet to avoid flooding. The cost was deemed too high, so in order to solve the problem while getting some return on investment, the site was turned into a landfill, accepting garbage from San Francisco. For those who prefer movement on land, there are miles of trails, both paved and unpaved, with some being part of the popular San Francisco Bay Trail. These are ideal for cyclists, runners and walkers. The trails connect with Stevens Creek on the east side of the park and the Baylands Nature Preserve of Palo Alto on the west side. Golfers can spend a relaxing day navigating an 18-hole links-style golf course, practicing on a driving range and checking out what’s new in the pro shop. Great times are always in store at the Shoreline Amphitheatre, an outdoor events venue with seating for 29,000 and an additional capacity of 16,000 on the lawn. Acts and festivals that have graced the stage include The Grateful Dead, Dave Matthews Band, All That! Music and More Festival, Crue Fest 2, Lilith Fair, Lollapalooza, Ozzfest and Rock the Bells. Regardless of how active or inactive you are at the park, when you get hungry, there’s the perfect destination: The Shoreline Café. It’s open weekdays for breakfast and lunch and weekends for brunch. An eclectic menu will satisfy just about any taste. Also available are specially made picnic baskets with chocolate strawberries, fresh fruit, cheese, Italian panini, wine and champagne. Learn more at the Shoreline Aquatic Center and Café website. July 20, 2013 Daniel G.
If you have spent any amount of time in the Bay Area, you will know that many residents are cycling enthusiasts. 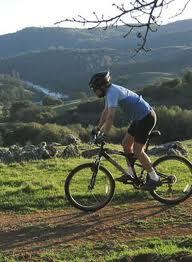 Residents ride for various reasons – to exercise, commute to work, be eco-conscious or just to have fun. This passion is fueled by the area’s temperate weather and beautiful terrain that is perfect for a pleasant evening ride or a grueling weekend workout.Most Bay Area cities are realizing that bicycles are a popular form of transportation and now offer bike friendly routes which are safer for the rider, particularly during rush hour. Recently, the City of San Jose added 8 miles of new bike lanes downtown, many with extra space between motorists and bicyclists. To encourage people to use their bicycles more, Caltrain offers a public bike share system near 50 Caltrain stations located in Redwood City, Mountain View, Palo Alto, and San Jose, as well as free passage for your bicycle. The popularity of cycling can also be seen in the burgeoning membership of Bay Area cycling clubs and teams as well as the number of pelotons (cycling term for a cluster of riders) you see on the weekends.